The jaw crusher company plans to build a quarry to meet the needs of building stone materials in Malaysia. 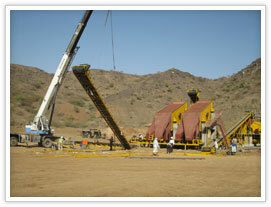 SBM supplies the complete crushing plants and service. The complete crushing plant are used to crush big rocks into small size or sand for construction and other purposes. The raw stones of quarry are mostly limestones. The project is the broad heading. The capacity of crushing must be upto 800 - 1000 TPH. And it’s purpose is to provides the building aggregates and sands for infrastructure. SBM’s project scope includes the complete crushing plant with crushing and screening process including designing, installation, and maintenance services. SBM also provides some spare wear parts of crusher machines.